If you're trying to reduce your energy consumption and go green, you've no doubt considered installing solar panels or a solar power kit on your home. There are a few things you should consider before calling a contractor or thinking about installing a system yourself. To get the most out of your system you'll need to ensure you have the proper site. Let's talk about what goes into site suitability for photovoltaic systems. Obviously there are good and bad areas of the country for solar panels. 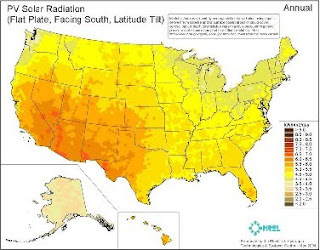 The sunny southwest, From Texas to Southern California, has the best sun exposure in the US. Other great places are the Rocky Mountain state of Utah, Colorado, and Nevada and the Southeast states of Florida and Georgia which have ample sunny days. The Midwest and South are considering 'good' but generally have rainy, overcast winters. The Great Lakes States and the Northeast are considered not great for solar, but in some cases systems can still be productive. Obviously places in the Caribbean and Hawaii are outstanding candidates for solar power as well. Solar insolation data from NREL, Darker color means better for solar. Where Can You Put The System? Southern exposure: this will allow the panels to be exposed to the sun for largest portion of the day. Shade-free: even shade from small objects like roof vents can significantly decrease the output of a system. Close to the power meter: the closer the panels are to your home and the meter the lower your power losses in the cabling will be. Out of the way: while the system isn't really dangerous, they do create high voltage and therefore should be in a safe place away from high traffic areas. If you don't have a suitable roof area for the panels, don't worry, there are plenty of ground mounting options. You can also use a shed or detached garage as long is its reasonably close to the house. Don't forget that you'll need to account for seasonal shifts in the sun's angle to make sure your panels don't receive shade in the winter. What Angle Should They Be? The angle of the panels should be equal to the latitude of your site. So if you live in Boulder, CO, where the latitude is about 41 degrees, the panels should be at an angle of 41 degrees from horizontal. If you're not sure what your latitude is, check out this latitude map of the US. You can approximate your latitude, it does not have to be exact. If you're roof doesn't match the latitude exactly, getting within 10 degrees with suffice. Any more and you should consider a tilted mounting system, which will add to the cost but will pay for itself in added power production. Low horizons: Sites in canyons or next to mountains usually won't work. No shading: Heavily forested areas generally won't work. Clear area: Since the system moves, you'll want the ground around to be clear. Another consideration is the incentives and rebates. If you don't get incentives for power production, just installed watts, the incentives won't reimburse you for the expense of the tracker. Armed with this information, you should be able to determine if your home or business is suitable for a system. The next step is determining just how much you can afford. Kriss Bergethon is a solar expert and writer, for more information, check out his website at Solar Garden Lights.